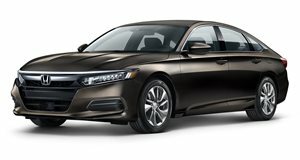 The range-topping Accord enters into premium territory that rivals the Audi A4. Standard with the more powerful 2.0-liter turbocharged engine, adaptive suspension adds further comfort while the 19-inch alloy wheels add style along with chrome exterior body accents. Other upgrades include illuminated door handles, automatic wipers, adjustable driving modes, and importantly a driver head-up display. While the Sport is our recommendation for purists, the Touring is our recommendation for outright luxury.